What we saw in the MWC 2013 Habemus Beta! This section aims to show you every single step in our development progress. We believe there is no better way to do that do it in 25 frames per second … so we will have always our DSLR camera ready for recording! Have you seen the video? … we hope you liked it! We want to remember you that eKameno is not only a mobile application for control the lights in your house or keep it save. Is much more than this, eKameno is a community. But neither have we done this section in order to take photographs and videos of ourself… there are mirrors to do this! … This time we present the second movie of ekameno, we want to open to you the doors of our offices and make you partaker of our evolution, showing the great work atmosphere and the cooperative work way that we use. After all eKameno is for you, for everyone … to change the world. 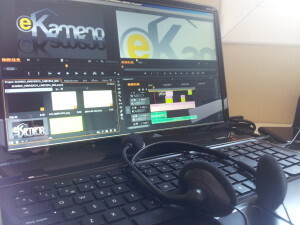 You could see a short film every week showing to you the eKameno Little skills. Little is coming soon. But until that time comes we will show you what we are doing, how we do it and last but not least, what is eKameno Little. We hope that this section makes you feel like you are part of the project. Our philosophy is always be working to reach this objective. By the way … if there is someone curious about the video production , we use a Canon 600D, (hd, 16/9 – 1920 x 1080) and post-production with licensed Adobe Premiere CS6.